Twenty-seven extracts from 26 plants were identified as photo-cytotoxic in the course of our bioassay guided screening program for photosensitisers from 128 extracts prepared from 64 terrestrial plants in two different collection sites in Malaysia - Royal Belum Forest Reserve in the State of Perak and Gunung Nuang in the State of Selangor. One of the photo-cytotoxic extracts from the leaves of Phaeanthus ophtalmicus was further investigated. The ethanolic extract of the leaves from Phaeanthus ophtalmicus was able to reduce the in vitro viability of leukaemic HL60 cells to < 50% when exposed to 9.6 J/cm2 of a broad spectrum light at a concentration of 20 μg/mL. Dereplication of the photo-cytotoxic fractions from P. ophthalmicus extracts based on TLC Rf values and HPLC co-injection of reference tetrapyrrolic compounds enabled quick identification of known photosensitisers, pheophorbide-a, pheophorbide-a methyl ester, 132-hydroxypheophorbide-a methyl ester, pheophytin-a and 151-hydroxypurpurin 7-lactone dimethyl ester. In addition, compound 1 which was not previously isolated as a natural product was also identified as 7-formyl-151-hydroxypurpurin-7-lactone methyl ester using standard spectroscopic techniques. Our results suggest that the main photosensitisers in plants are based on the cyclic tetrapyrrole structure and photosensitisers with other structures, if present, are present in very minor amounts or are not as active as those with the cyclic tetrapyrrole structure. Malaysia is well-known as one of the mega-biodiversity country in the world. Among the places that Malaysia has restricted their access as forest reserves are Royal Belum Forest Reserve and Gunung Nuang at the Langat Forest Reserve. The Royal Belum Forest Reserve which is estimated to be 130 million years old , covers an area of 3000 km2 and is home to numerous plant species as well as over 270 species of birds and 100 species of mammals . Gunung Nuang or Mount Nuang with its highest point at 1495 m above sea level  is situated in the Langat Basin which covers an estimated area of 2937km2 and is covered in dipterocarp forests. In our search for potential novel photosensitisers from the under-explored natural habitats of Malaysia, 64 plant samples were collected from Gunung Nuang and Royal Belum Forest Reserve. Photosensitisers are compounds employed in photodynamic therapy to generate reactive oxygen species in the presence of light and molecular oxygen for removing abnormal cells and tissues in the treatment of some forms of cancer and other non-oncological diseases . This paper describes the sourcing and testing of 128 plant extracts using a MTT-based photocytotoxicity assay, and bioassay guided fractionation of one of the active samples Phaeanthus ophthalmicus, identification of known photosensitisers in the extracts by comparing with in-house standards and isolation and elucidation of one new photosensitiser. A total of 128 extracts were obtained from the 64 plants collected in July 2007. These plant species are from 39 different families (Table 1). A sample is considered photo-cytotoxic if it causes the cell culture to be < 50% viable when exposed to light and if the % cell viability of the culture with the sample in the dark is more than double the % cell viability in the presence of light [5–8]. Following these criteria, 27 of the extracts were identified as photo-cytotoxic. Three samples from Garcinia malaccensis (root), Shorea sp. (leaves) and Disopyros sp. (fruit pulp) showed cytotoxicity even when unirradiated (< 50% cell viability in the unirradiated experiment) and therefore were not investigated further in this study. The 27 photo-cytotoxic extracts were from different plant species except for Anaxagorea javanica which contributed two extracts from its bark and leaves. Other than the bark extract from A. javanica and the whole plant extract from Piper caninum, the remaining 25 photo-cytotoxic extracts were all prepared from the leaves. The photo-cytotoxic extract from the leaves of P. ophthalmicus was subsequently subjected to bioassay guided fractionation using standard chromatography methods to identify the photo-cytotoxic constituents. Phaeanthus ophthalmicus is a small shrub commonly found in shady forest . No literature related to its phytochemical or ethnopharmaceutical uses have been reported for this species. Of relevance to this study, this species has not been studied for photosensitizing activities also. As a genus, Phaeanthus belongs to the family Annonaceae (blumea) which is the largest family of the magnolia order (Magnoliales). The Annonaceae family consists of trees, shrubs, and woody climbers found mainly in the tropics, although a few species extend into temperate regions . Even though the Annonaceae family elaborates a broad array of secondary metabolites , the genus Phaeanthus has not been studied extensively and only a small amount of literature related to its phytochemical or ethnopharmaceutical uses have been reported. Among the phytochemical studies on the genus Phaeanthus including P. ebracteolatus, P. vietnamensis and P. crassipetalus, have reported compounds such as phaeanthine, phaeantharine, argentinine, limacine, O,O'- dimethylgrisabine and 7-O-methylgrisabine [12, 13], and importantly none of these compound classes have been used as photosensitisers for photodynamic therapy. Thin layer chromatography (TLC) profiles of active fractions 2 - 17 (hexane: ethyl acetate, 7:3, v/v) from the leave extract of P. ophthalmicus were obtained together with our in-house standard photosensitisers. Pheophorbide-a, pheophorbide-a methyl ester, 132-hydroxypheophorbide-a methyl ester, pheophytin-a and 151-hydroxypurpurin 7-lactone dimethyl ester were identified as present in fractions 2-16 according to TLC, and would explain the photo-cytotoxicity observed in these fractions. The presence of the known compounds in the active fractions was further confirmed by co-injection of the standard photosensitisers with fractions 2-16 in HPLC analytical runs. Furthermore, as none of the standard photosensitisers co-eluted with constituents in fraction 17, this fraction may contain new photosensitisers and was selected for further analysis and purification using HPLC. A yellowish green compound (1; Figure 1) was isolated (< 1 mg) from HPLC purification of fraction 17. The HRMS analysis of the isolated compound gave the observed [M + 1] peak at m/z 639.2495 (calculated [M + 1]: m/z 639.2455, 6.3 ppm), consistent with molecular formula of C35H35N4O8. Compound 1 has additional 14 a.m.u. compared to 151-hydroxypurpurin-7-lactone methyl ester (2) , in line with the proposed replacement of the methyl group at C-7 in 2 with an aldehyde in 1. In addition, the mass fragments observable at m/z 621, m/z 579 and m/z 552 were in accordance with the loss of H2O (18 a.m.u. ), C2H4O2 (60 a.m.u.) and C3H3O3 (87 a.m.u.) from the molecular ion. These mass losses of 60 a.m.u. and 87 a.m.u. were similar to those observed by Walker et al  for 151-methoxylactonechlorophyll-a, thus suggesting that compound 1 also contained a lactone ring structure. The UV-vis absorption spectrum of 1 showed λmax at 226 nm, 427 nm and 651 nm, characteristic of a pheophorbide-b-type structure . The 1H NMR spectrum of 1 revealed resonances that are typical of pheophobide-b, including a singlet proton signal at δ 11.21 for the aldehyde at C-7, three singlet signals assignable to H-10, H-5 and H-20 at δ 10.53, 9.91 and 8.66 ppm respectively, a vinyl group at C-3 with signals at δ 8.05 (dd, J = 11.4, 17.4 Hz), δ 6.45 (d, J = 17.4 Hz) and δ 6.26 (d, J = 11.4 Hz), and signals for the two methyl groups which are directly connected to the conjugated ring system at δ 3.79 (H-121) and 3.43 (H-21). Due to the presence of the electron-withdrawing aldehyde moiety at the position of C-7, the observed chemical shifts of the protons surrounding the tetrapyrrole skeleton were more de-shielded compared to the reported literature values for pheophorbide-a type compounds . On the basis of these evidence, compound 1 was identified as 7-formyl-151-hydroxypurpurin-7-lactone methyl ester. Chemical structure of compounds 1 and 2. 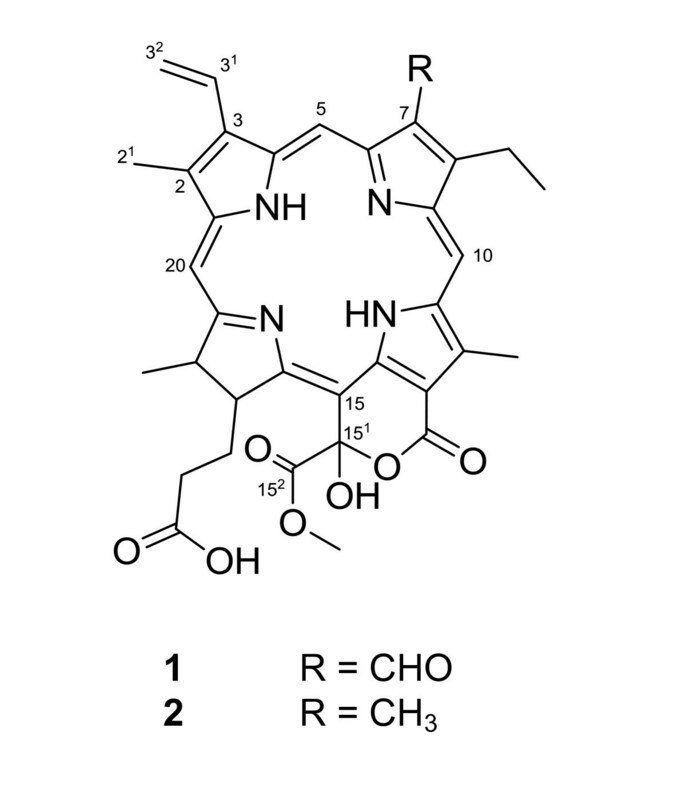 Compound 1 has not been reported to be a natural product from plants and no spectroscopic data for the exact structure is available in the literature. However, compound 2 (Figure 1) which has a C7 methyl group is a chlorophyll-a equivalent of compound 1, and has been cited to be found in an oxidised leave extract . Since derivatives such as compound 2 with an exocyclic lactone ring can be prepared by oxidation of the parent pentacyclic chlorophyll-a structure and have been identified in plant extracts , compound 1 is probably also derivable from chlorophyll-b which is ubiquitously present in green leaves together with chlorophyll-a. In this study, 128 crude extracts from 64 Malaysian terrestrial plants collected from the Royal Belum Forest Reserve and Gunung Nuang Langat Reserve Forest were screened for photo-activity in a cell-based assay. Twenty-seven of these extracts showed photo-cytotoxicity at 20 μg/mL and when exposed to 9.6 J/cm2 of a broad spectrum light. One of the photo-cytotoxic extracts from the leaves of Phaeanthus ophthalmicus was further investigated through bioassay-guided fractionation of the extract to yield seventeen fractions. Based on TLC and analytical HPLC analysis with known standard compounds in our organisation, five known photosensitisers were successfully identified in fractions 2-16 as pheophorbide-a, pheophorbide-a methyl ester, 132-hydroxylpheophorbide-a methyl ester, pheophytin-a and 151-hydroxypurpurin 7-lactone dimethyl ester. The photo-cytotoxic fraction 17 consisted of a new compound which was isolated and elucidated to be 7-formyl-151-hydroxypurpurin-7-lactone methyl ester based on spectroscopic data. This is the first effort to study the photosensitisers present in P. ophtalmicus and further characterisation of compound 1 as a photosensitiser for photodynamic therapy is underway. Light doses were measured using Nova-Oriel power meter. The 96-well microplates were read using ThermoLabsystems OpsysMR microplate spectrometer. Columns for chromatography were packed using Silica gel F254 Merck Kieselgel 60 (70-230 mesh). High Performance Liquid Chromatography (HPLC) analysis of extracts and fractions was performed using Shimadzu system equipped with LC-10AT VP pumps, SPD-M10AVP photo-diode array (PDA) detector while purification of compound 1 was carried out using Waters HPLC system equipped with 2998 PDA detector, Waters 600 Controller and Delta 600 Pumps. Merck Chromolith® monolithic RP-18e, 4.6 × 100 mm HPLC column was used. The High Resolution Mass Spectrometry (HRMS) of the isolated compound was performed using Acquity™ Ultra Performance Liquid Chromatography (UPLC)-PDA system coupled to Synapt High Definition Mass Spectrometry (HDMS) Quadrupole-orthogonal acceleration Time-of-Flight (oaTOF) detector (Waters Corperation, USA) equipped with an Electrospray Ion source (ESI). The Nuclear Magnetic Resonance (NMR) analysis was done using Bruker Avance III 600 MHz FT-NMR spectrometer with CryoProbe. All chemicals and solvents used were of analytical grade. Pheophorbide-a standard for photo-cytotoxicity assay was purchased from Frontier Scientific Inc, USA. Plant materials were collected randomly along existing trails from Royal Belum Forest Reserve in the State of Perak and Gunung Nuang, Langat Forest Reserve in the State of Selangor on two separate expeditions consisting of members of the research team, a taxonomist from Universiti Putra Malaysia and the forest rangers in July 2007. The expedition to Royal Belum Forest Reserve was carried out at the northern region near the border of Thailand, along the Sungai Kejar river and the Rafflesia site which are lowlands and hill dipterocarp forests. Expedition to Gunung Nuang at the Langat Forest Reserve was carried out at 221.1 m above sea level along the walking trail near the running water pipeline. Taxonomic identification was performed by Shamsul Khamis from Institute of BioScience, Universiti Putra Malaysia and voucher of the specimens were recorded and deposited in the Applied Chemistry Laboratory Herbarium, Sime Darby Technology Centre, Malaysia. The plant materials were separated according to plant parts, washed and ground. The finely ground plant materials were extracted with ethanol for three days, and extraction of the same materials was repeat two more times. The combined ethanolic extracts were dried in vacuo and kept at 0°C before use. HL60 promyelocytic leukemia cells were obtained from ATCC and cultured in RPMI 1640 medium supplemented with 1%v/v glutamine and 10% foetal bovine serum (FBS) (Gibco). The assay described by Mosmann  was adapted to the measurement of cell viability with some modification. Briefly, test compounds were prepared as stock solutions of 20 mg/ml in DMSO and diluted accordingly in phenol red free culture medium supplemented with 5% FBS before use. In a 96-well plate, extracts at a concentration of 20 μg/ml were tested against 15 000 of HL60 cells per well for two hours at 37 °C in 5% CO2. All test compounds were assayed in four replicate wells (n = 4). The plates were then irradiated with a 300 W broad spectrum tungsten halogen lamp, with the infra-red radiation being removed by means of a 10 cm water column. Cell cultures were irradiated at 10.5 mW/cm2 light energy for a duration of 10 min, which corresponds to a light dose of 9.6 J/cm2. A duplicate experiment containing cells incubated with either the same samples but without light irradiation was conducted to serve as un-irradiated control. Then, the cells in both sets of experiments were incubated for a further 24 hours. Cell viability was then determined with the MTT (3-(4,5-dimethylthiazol-2-yl)-2,5-diphenyl-2H-tetrazolium hydrobromide) assay. MTT (Fluka) was diluted to 5 mg/ml in phosphate-buffered saline (PBS) just prior to use. A volume of 15 μl of this solution was added to all the wells. The plate was incubated for another 4 hours at 37 °C. Then, 70 μl of the supernatant was removed, and 100 μl of DMSO was added to dissolve the formazan crystals. Their absorbance was recorded on a microplate spectrometer at 570 nm, and the percentage of cell death was calculated relative to untreated cells. Approximately 50 g of the ethanolic crude extract from the leaves of P. ophthalmicus was fractionated by liquid-liquid partitioning into petroleum ether, dichloromethane, ethyl acetate and water fractions to yield 12.8 g, 3.6 g, 8.1 g and 26.3 g of dried fractions respectively. All of the fractions were assayed for photo-cytotoxicity and the petroleum ether fraction was found to be active in the bio-assay and was further fractionated using standard silica gel eluting with solvent in increasing polarity (hexane, ethyl acetate and methanol). The fractions were collected based on visual bands, dried in vacuo and tested for photo-cytotoxicity. A total of 17 fractions were collected and fractions 2 to 17 showed photo-cytotoxicity at a concentration of 10 μg/mL. Fraction 17 was subjected for further isolation and purification using Waters HPLC system with 2998 PDA detector; Waters 600 Controller and Delta 600 Pumps, eluted at a constant rate of 1 ml/min, in a gradient of 40% to 80% of acetonitril (0-5 mins), from 80% to 100% of acetonitril (5-15 mins) and hold at 100% acetonitril for 5 mins, using Merck Chromolith® RP-18e, 4.6 × 100 mm column. The peak which was eluted at Rt 1.81 min and which had UV-vis absorption maxima at 226 nm, 427 nm and 651 nm was collected as compound 1. CARIF is a non-profit research organisation. We thank the sponsors of CARIF for partly funding this work. CYO performed the photo-cytotoxicity testing of 128 extracts. PJT was involved in the isolation, purification and identification of compound 1. AD and HMY participated in the sample collection and the preparation of the plant extracts. HBL and BKN participated in the study design and coordination of study. HBL, PJT and CYO contributed to the drafting of the manuscript. All authors have read and approved the final manuscript.